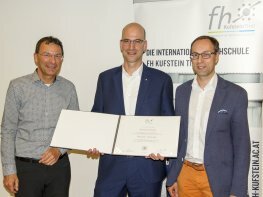 The FH Kufstein aims to give students an education that is both international and practically oriented so that they have the best possible chances on the job market and for furthering their career. Full-time students of the FH Kufstein complete at least one internship as an integral part of their studies. The university has excellent contacts to various industries and to the community – currently relationships are maintained with more than 300 companies and organizations all over the world – and students can tap into this network to find a suitable and enriching internship in Austria or abroad. The internship gives students the unique opportunity to put their recently acquired knowledge into practice and to gather professional experience. In line with the educational objectives of their studies, an essential aspect of the internship is that students do not simply carry out tasks in their position, but rather take on management responsibilities in administrative, strategic or organizational areas of the host company. Thus, for many of our students, the internship represents their first step into or their first step up in their career. Alumni & Career Services is responsible for coordinating the student internships and for supporting students to find the best placement for them. Also, the director of studies for the degree program must give final approval to the student’s choice of internship to ensure that it meets the rigorous demands for a high quality, professional experience.